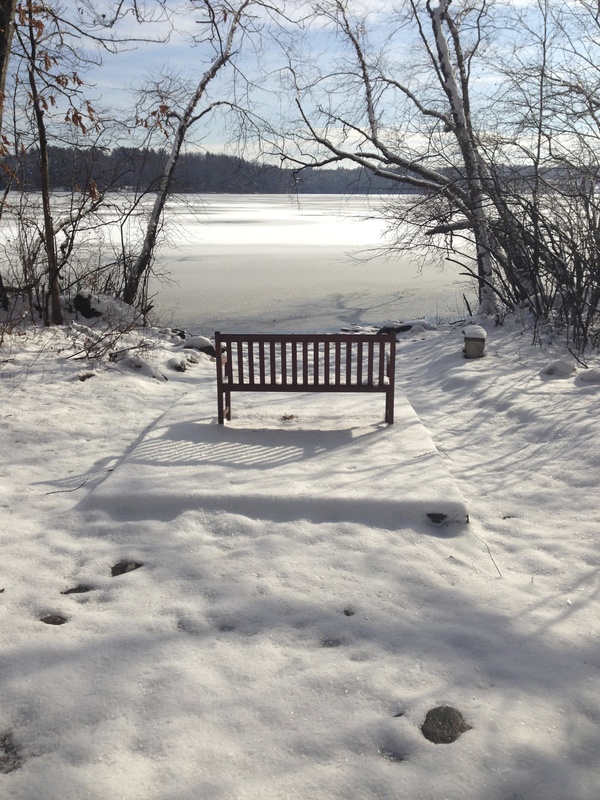 It snowed here last week — crisp and white and heavy. I’d planned for a snow day and finished my work early, but the kids wound up having school. And so I found myself with several whole hours and nothing (besides laundry! writing! dinner!) to do. I decided to play hookie and go for a hike. Near the preschool where my children went is a parcel of conservation land. When the kids were little, I knew it well. The school was just far enough, and the program just short enough, that most days it didn’t make sense to go back home after I’d dropped them off, so I spent many of those two-hour segments wandering the trail. I still hike there from time to time, but almost always the shorter loop — the longer one requires a time commitment I’m rarely free to give. Last week, it felt almost sinful to start down the longer path, but I did. The trails have changed since my children were little — the conservation organization has added new paths and extended old ones. The snow had covered the way in several places, and I had to backtrack until I found the right direction. And then I found a pair of footprints leading off on their own, through a part of the woods I hadn’t visited before. I was hiking by myself. Normally I have the Slobbering Beast for company. He’s an ideal companion — an 80-lb missile of muscle with Orca jaws and white shiny teeth, ready to have my back if required but a waggle-bottomed enthusiastic greeter of the toddlers and their parents we sometimes encounter. He’s also my personal GPS. He can find a trail in any condition, and is a stickler about staying on it. (Unless there are bunnies, in which case deviations are allowed.) But even the most handsome Beast occasionally needs to be bathed, whether he wants to be or not, which is why I was on the trail and he was getting his nails cut. So when I saw the footsteps, I hesitated. I worried whether I would be able to find my way back. I wondered who I’d encounter on my own, with no Beast by my side. But the woods were lovely, dark and deep, and I had no promises to keep that day. Except to myself, so I stepped off the path and wandered away. And it was lovely. Peaceful and quiet, aside from the ice and snow falling from the trees, shattering into a handful of sparkles when they hit the ground. 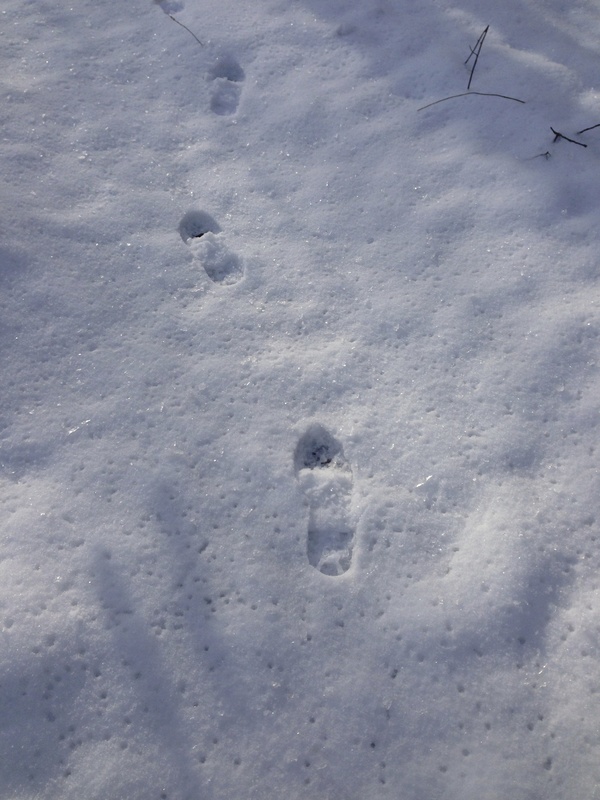 There were deer tracks, raccoon prints, and disturbingly large dog-like tracks that appeared on their own and disappeared down a little gully, but the only human prints were those that I’d followed into the woods. And then they veered up, toward where the trees broke along the meadow, but I continued on, along the hint of the path ahead, which curved and double-backed and eventually met up with the main trail, at the exact spot at which I’d meant to be. But the way I’d gone this time was so fresh and new to me, I was able to see it with clear eyes, and so the journey was completely different than it might have been. Writing is like that. Sometimes you have to break away from the known, from the carefully constructed outline you’ve made, and follow that hint of inspiration where it takes you. It may get lonely. You may come across something that disturbs you. But the journey will be your own. It will be unique, and it will be what your reader remembers, even if you end up in the exact same spot you’d intended all along. A nice piece of writing itself. And two roads diverged in wood . . . and that has made all the difference. Thank you, Norm. As always, I appreciate your support! What a lovely and apt analogy, Liz! And I know the feeling, re: the strange tracks. Around my neighborhood, there are so few of us, we know one another by our snow tracks. So it is always raises my brows when there are strange ones. The bottom pic is gorgeous. So true, so go the best laid plans in writing, and in life. And somehow you always end up exactly where you’re meant to be. Lovely, lovely post. Thank you for stopping by, Bernadette! I’m glad you enjoyed it. Getting outside, rain, snow or sunshine can make all the difference, Especially when, like you, you get the chance to go by yourself. You can focus on what’s around you, free from other’s impressions, opinions and noise. Lucky you, what a great opportunity. I agree, Connie — hiking by yourself is a completely different experience. And sometimes it is exactly the gift you need to give yourself. Thanks for reading.